This newly revised handbook presents a multifaceted view of systems engineering from process and systems management perspectives. It begins with a comprehensive introduction to the subject and provides a brief overview of the thirty-four chapters that follow. This introductory chapter is intended to serve as a "field guide" that indicates why, when, and how to use the material that follows in the handbook. Topical coverage includes: systems engineering life cycles and management; risk management; discovering system requirements; configuration management; cost management; total quality management; reliability, maintainability, and availability; concurrent engineering; standards in systems engineering; system architectures; systems design; systems integration; systematic measurements; human supervisory control; managing organizational and individual decision-making; systems reengineering; project planning; human systems integration; information technology and knowledge management; and more. 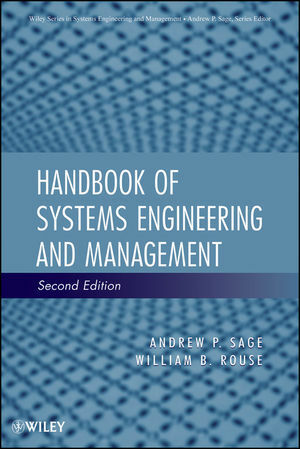 The handbook is written and edited for systems engineers in industry and government, and to serve as a university reference handbook in systems engineering and management courses. By focusing on systems engineering processes and systems management, the editors have produced a long-lasting handbook that will make a difference in the design of systems of all types that are large in scale and/or scope. Andrew P. Sage, PhD, became the First American Bank Professor of Information Technology and Engineering at George Mason University and the first Dean of the School of Information Technology and Engineering. Dr. Sage is a member of the National Academy of Engineering, as well as a Fellow of the IEEE, the American Association for the Advancement of Science, and INCOSE. He is the Editor of the Wiley Series in Systems Engineering and Management and of Wiley's Journal of Systems Engineering. William B. Rouse, PhD, is a professor in the School of Industrial and Systems Engineering at the Georgia Institute of Technology and holds a joint appointment within the College of Computing. He also serves as Executive Director of the Tennenbaum Institute, a campus-wide research center focused on complex organizational systems. Dr. Rouse is a member of the National Academy of Engineering, as well as a Fellow of the IEEE, the International Council on Systems Engineering, the Institute for Operations Research and the Management Sciences, and the Human Factors and Ergonomics Society.